I can't really label myself as having any one particular "style" because I like a little bit of everything and never feel inclined to limit myself to only wearing a certain type of clothing. But if I had to put a description on my everyday wardrobe, I'd probably say something like "bohemian casual" (mainly because I wear a lot flow-y comfortable things). 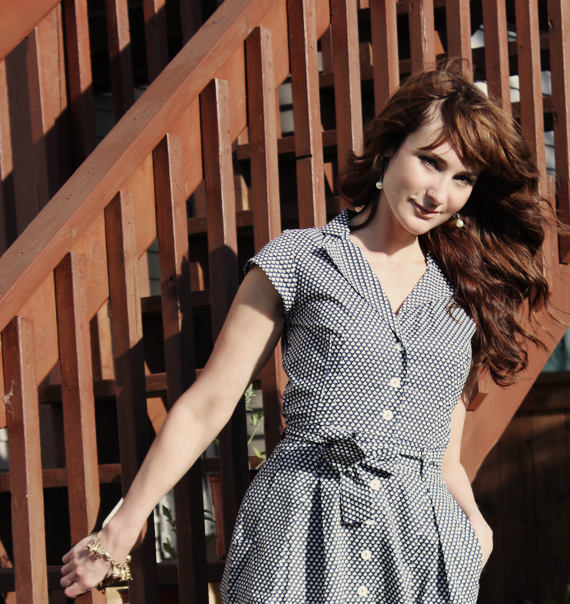 If it's time to dress up, however, I have a weak spot for tailored, early '60s vintage and vintage-inspired dresses. I especially like to wear these types of dresses for semi-formal daytime occasions, which (let's face it), don't happen all that often in a normal person's life. Yesterday was a special day - it was one of those few and far between occasions where I got to dress up in my "Sunday best." I attended my dear friend Annie's baby shower, which was held at a sweet little eatery right downtown. The girls and I had a great time just hanging out, talking, drinking mimosas (or sparkling orange juice for the mamas-to-be), and showering Annie with love. 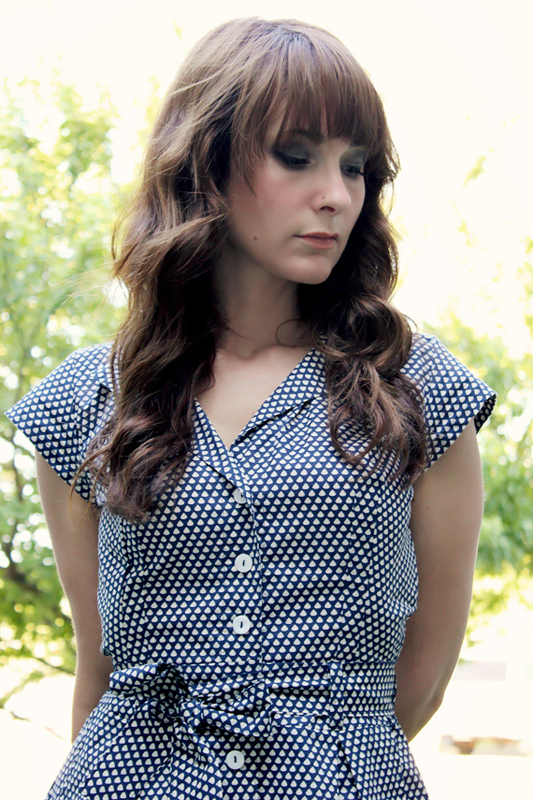 And I got to wear a very pretty, vintage-inspired tea party style dress. 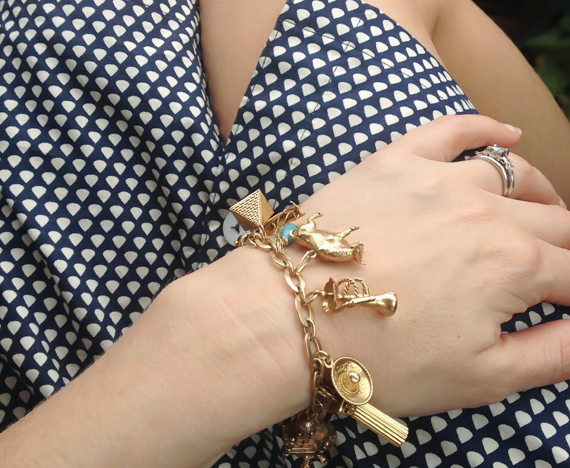 I decided to pair the dress with an actual late '50s/early '60s piece of jewelry - my grandmother's charm bracelet. This bracelet is one of my most treasured possessions, and I don't wear it often because of a slightly irrational fear that I'll somehow break it or lose it or just look at it the wrong way. My grandmother ("Maggo") used to be a world traveler, and she'd pick up a charm for the bracelet every time she'd visit a new country. It has everything from a Spanish bull to a hookah to a pyramid, and it's pretty amazing to get to listen to her tell the stories about the charms and the adventures that went along with them. My wedding and engagement rings were Maggo's as well, by the way. They were in rough shape, so we have molds made from them and had exact replicas made, using the original diamonds (which date to the early 1900s). They are some of my most treasured possessions too. It was a lot of fun to get to play dress up and to have a nice, relaxing day before what promises to be a fairly crazy week. My 'to do' list for the next few days is pretty intense, and then I leave for San Francisco at the break of dawn Thursday morning. I have some exciting news to share in regards to this trip, so be sure to stop back by tomorrow for details! I hope you guys had a great weekend, and that you have an equally wonderful Monday. That dress is sooooooo pretty, how great that it's organic too!!! I love daytime excuses to dress up :-D. Lovely styling with the shoes and hat and bracelet!! that's so cool about your g'ma's charm bracelet. Love the whole outfit! Everything! Lovely! Your charm bracelet is more then ootd worthy. Out of this world! Oh my god, I couldn't watch that one scene in the office. You know what I'm talking about. I cried, too. But onto happier subjects, that print is adorable! It was awful - I had to look away too. Totally beautiful. Love your dress! Such a cute dress! I could see how this would be a 'Sunday Best' outfit for sure. (And yes, I have "Put on Your Sunday Best" from 'Hello Dolly' in my head now ; ] ) I think my favorite part of your outfit is the bracelet though. I love charm bracelets! And the stories that go with the charms are even better. Mine aren't nearly as exciting as your grandmothers' must be, but hopefully it will be something someone treasures when I pass it on to them, like you do yours. Also, the background for these pictures looks so beautiful! What a view! I just went to buy this dress and it looks like they sold out. :-( It was still available when I read your post this morning at work. Hopefully they get more in because it's gorgeous! I love this beautiful dress! I tend to go flow-y all the time, too... mainly because my body shape isn't so flattered by tailored clothing. My favorite part of how you styled this dress is the shoes, for the pop of color. I can't really label myself as having any one particular "style" because I like a little bit of everything and never feel inclined to limit myself to only wearing a certain type of clothing." that is 100% ME. Second: you look amazing, girl. That dress fits you - not just in style, but in flare perfectly. So you. Third: That bracelet is AMAZING. Bulls are something I am often on the lookout for (a power animal of mine), I smoke hookah with Jen often and I love Egypt and pyramids. What a bracelet! oh how i adore san francisco! have a fantastic time melissa. i like your grandma's charm bracelet. :) your hair & make-up look lovely.